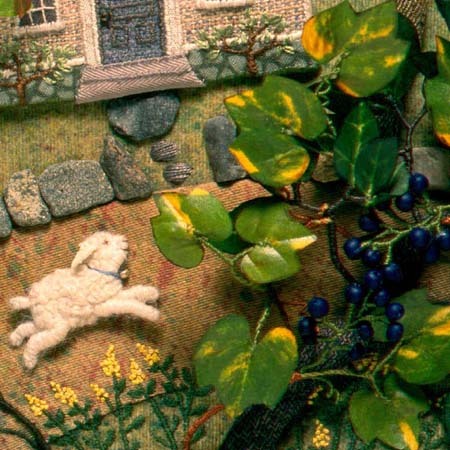 This entry was posted in Children's Books, Closeups, Fabric Relief, Food, illustration, Pins, Salley's childhood art by Salley Mavor. Bookmark the permalink. Love all the grapes but particularly like the “faux tile.” That whimsical kitty and grape wine are just delightful! So glad to see them used in your art. Wild Concord grapes are less abundant than they used to be in CT probably due to the fact this small state has been developed heavily. Serendipity to smell them like that! Years ago I would gather branches for wreaths on the property I owned then and decorate the dried wreaths to sell. Definitely a New England a New England icon with a distinct odor that heralds oncoming autumn. Did you get your borders done? Thanks for asking, Helen. 3 borders to go! All 3 of your books arrived (the signed one from “Eight Cousins” came yesterday) and it is SO multi-layered….I have one open on the page being perused and it takes a long time to see all the details. The signed one is for me, the 2nd for my first grandchild (was just told my daughter-in-law is pregnant and we’re ecstatic about it) and the 2nd one for a 2nd child if she ever gets pregnant again. So….the little ones hoped for have theirs awaiting their birth and they will love them. You must be SO happy to come to the end of the project….such a huge endeavor with the show. DO list where it will be in the remote chance of being near one. Congratulations! !